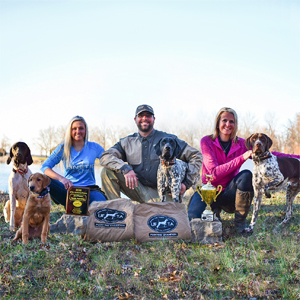 RLGD’s passion is to hunt, guide, train, & trial bird dogs. Traveling throughout the United States hunting a variety of wild bird species is what they love to do. They train their dogs to compete in a variety of field trials across the United States. Their dogs are the biggest part of the family. It is all about having a great time, while being family oriented. It is quality over quantity for Rustic Lodge Gun Dogs and their current kennel is full of young pups. Along with training and hunting over their dogs, they enjoy getting the youth hunters of today involved. There is no future without these young ones and stepping in to make a difference is one way they believe in making an impact. They are currently active with AKC hunt test, Dockdogs, North America Diving Dogs (NADD), and the United Field Trialers Association (UFTA). Brent, Ally and Sammi are all registered judges for the UFTA.